Demonstrators protect Prince George's casino bill. There’s no escaping the gambling craze, whether in the dripping heat of Annapolis in August or the sunny beaches of a cooler Rhode Island. Even little Rhody is into the latest jobs scheme. If you can’t gin up jobs in manufacturing – say at a decades-old steel mill – expand gambling and create other jobs. But even if the bill passes both Senate and House – and the House is still a big question mark – none of the construction jobs will be showing up for at least two years and most of the permanent jobs won’t appear until O’Malley has long departed the State House. The bill says any new casino in Prince George’s County cannot open till at least July of 2016, or 30 months after the yet-to-be-built Harrah’s Casino in Baltimore City opens, whichever is later. 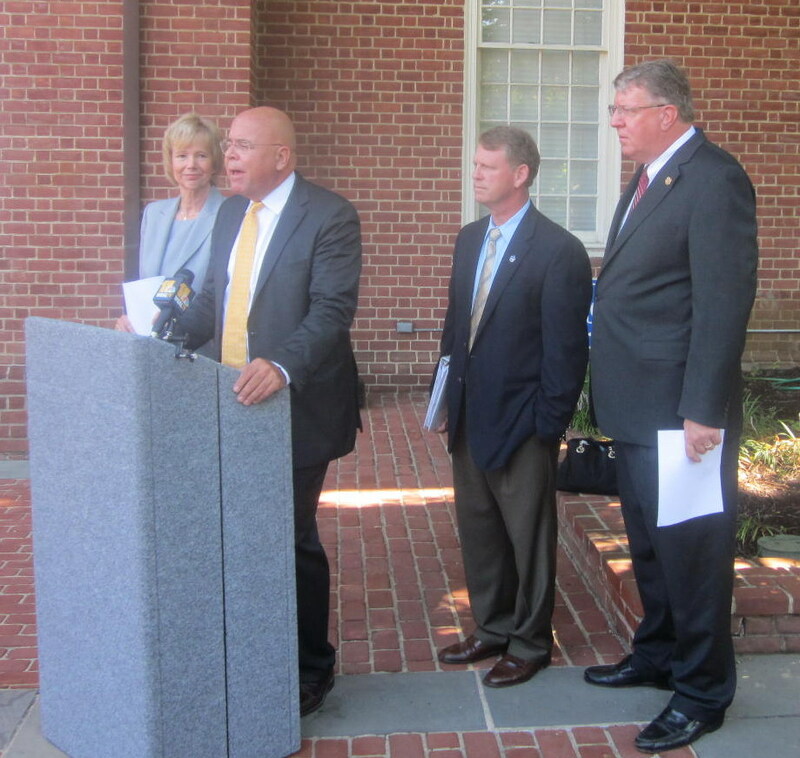 At least the gaming push has provided summer employment for dozens of the Annapolis lobbying corps. All the gaming companies and the potential developers have hired their own lobbyists, not just one or two in most, but three or four from different firms. Some Prince George’s residents were having none of the job promises Thursday. Lisa Ellis of the Prince George’s County Contractors and Business Association told a rally of a few dozen that the construction jobs will likely go to union laborers, mostly from out of state. The bill as proposed by the governor does not specifically mandate union labor, but it does allow Prince George’s County to make that a requirement for construction. Union leaders surrounded O’Malley when he announced the special session two weeks ago, and Wayne Frazier of the Maryland Washington Minority Contractors Association supported the bill at the hearing Thursday. 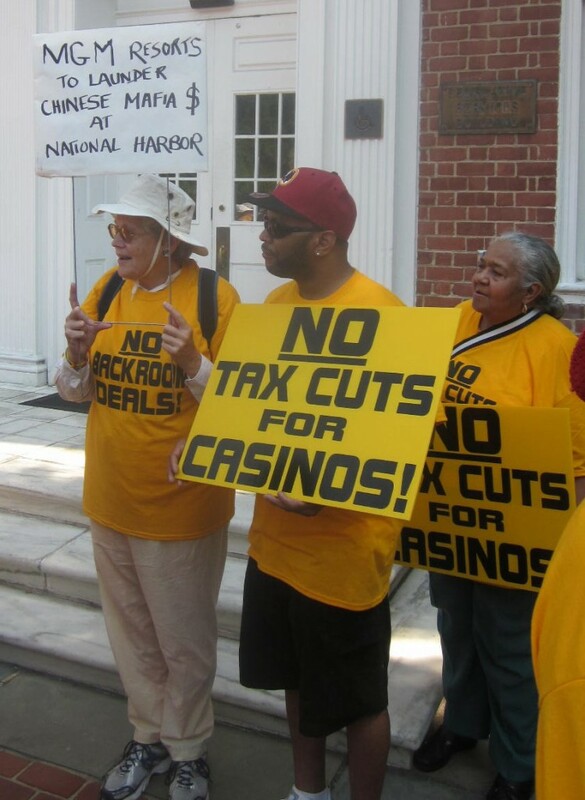 The current 67% tax on casino profits are the highest in the nation, and the O’Malley bill provides a 5% cut for the Arundel Mills and Baltimore City casinos to support “marketing, advertising and promotional costs” in 2016. The bill also allows the reconfigured lottery and gaming commission to reduce the tax by another 5%, and gives another 6% break when the casino operators take over ownership of the video lottery terminals. So overall, the bill could potentially bring casino tax rates down to about 51%, more in line with what other states charge casinos. The tax rate for the addition of table games – not just roulette, poker and blackjack but baccarat and the Asian card game “sic bo” – will only be 20%. Sen. Nathaniel McFadden, vice chair of the Senate committee, offered an amendment that easily passed giving 5% of the table game proceeds from Harrah’s to Baltimore City for school buildings. Among many other provisions of the 47-page bill legislators and staff were still trying to digest was removing the ban on live entertainment at Ocean Downs, which currently is only allowed to have a single piano player. (Yes, that is actually part of current law.) Ocean City clubs and hotels back the ban at the nearby racetrack, and Sen. Jim Mathias, the former mayor of Ocean City, tried unsuccessfully to have the ban restored. Struggling Oceans Downs also gets a tax cut to 43% next year. Despite the complicated nature of the legislation, few other amendments were proposed and the bill sailed through the Senate Budget and Taxation Committee 11-1. All three Republicans voted for the bill and only Sen. Ed DeGrange of Anne Arundel County, home of Maryland Live!, opposed it. Republicans are preparing a series of amendments to slow down the fast moving train, but it is expected to pass the Senate today without much change. Senate Republican leaders proposed their own 10-bill package of job creation legislation as they mocked the jobs created by the gaming bill. The package includes a tax freeze, a cut in corporate taxes, regulatory review, a ban on requirements for union jobs and prevailing wages, and even a bill to make Maryland a right-to-work state — prohibiting a requirement for union membership in any job. All the GOP bills were assigned to the Senate Rules Committee, which has not even scheduled a meeting.